Frank Wingold’s new release „Virtues & Vices“ is a refreshing album both sonically and intellectually. The title is not a reference to the music jumping back and forth between emotional extremes; it is much more like the mutual attraction of the positive and negative poles of a magnet. For example, one can almost hear the saxophone player Niels Klein breathing; that’s how ultimately „human“ the music of Wingold’s band Clairvoyance is conceptualised and executed. This impression, however intentional it may be, is only part of the truth. Nothing is left to chance on this album; everything is well-constructed down to the last note. If Wingold and his fellow musicians were French, you could think of this band as a menage-à-trois between Jacques Thollot, Maurice Ravel and Charles Trenet: the love for syncopation, the jarring rhythms of Thollot, combined with Trenet’s distilled sense of melody and the both classicist and syncopated approach of Ravel are evident in the music of „Virtues & Vices“. Although Frank Wingold often emphasizes that he is greatly influenced by the North American guitarist Jim Hall; his guitar style seems to be more influenced by South American music (as can be heard in „Some Son Song“), and he acts as a blueprint for many of the American guitarists associated with European chamber music. Frank Wingold and his ensemble Clairvoyance proves us wrong every time we think a comparison with something already known would be appropriate. Even if occasional memories are evoked, „Virtues & Vices“ is a thoroughly original album, if not genre-defying, and will remain so for generations to come. World wide. 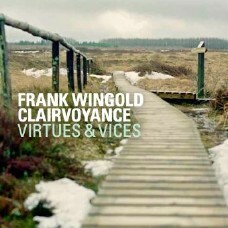 Guitarist and Clairvoyance founder Frank Wingold, who composed all of the music on „Virtues & Vices“, is a professor for jazz guitar at the Institut für Musik in Osnabrück, Germany, and teaches jazz guitar at the Prins Claus Conservatorium in Groningen, Holland. Wingold has also established himself as the founder of the groups Underkarl and agog. His trio agog won „Dutch Jazz Competition“ at the North Sea Jazz Festival in 2002. And already in 1993, his trio agog won the the „Europe Jazz Contest“ in Brussels, where he also received the prize for best soloist. Niels Klein joined in the German big band „BuJazzO“ in 1998, the same year he started his saxophone and composition studies at the Musikhochschule Köln. Three years later, he joined to the group „Heavytones“, the house band in Stefan Raab’s late night TV Show, with whom he stayed until 2009. Then he took over the position of artistic director of the BuJazzO and the NDR Big Band. He is now a professor at the Institut für Musik in Osnabrück, and teaches jazz composition and arrangement, ear training and theory. The drummer Jonas Burgwinkel already began his studies at the Konservatorium in Maastricht, Holland at age 17, and received further training at the Berklee College of Music and at the Musikhochschule Köln. In 2009, he received the WDR Jazzpreis for improvisation and is already regarded as one of the most sought-after and active jazz musicians of his generation in Germany.